Palpatine (a.k.a. The Emperor, a.k.a. Darth Sidious) -- the Dark Lord comes in four different variations of LEGO minifig. I may have pretended all of them could shoot lightning out of their hands while making a crackling noise. Pig -- It's featured in a new set -- the Pig Farm and Tractor -- and as a customized element from BrickForge. 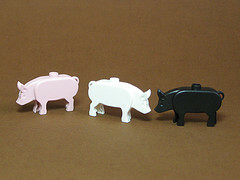 It's a LEGO pig's world, we're just living in it. Pick A Brick -- the chance to literally get to pick your bricks. A selection online or in retail stores, where you can fill a container with any of the available elements and then you pay a set price. This is as close to a candy store for adults as possible. Pepper Roni -- Parents saddle their children w/ unfortunate names. Pepper Roni is perhaps an extreme example, but the ill-named, skateboarding offspring of Mama and Papa Brickolini at least got to star in his own video game. Power Miners -- A LEGO theme introduced last year that features human minifigs with oversized drilling machines battling underground rock monsters. Rock monsters are apparently repelled by the heavy use of lime green parts -- a theory that is advanced by the lead scientist among the Power Miners. His name? Brains. Image via The Brothers Brick.